Thank You to All Attendees!! We want to thank you for attending our inaugural Africa/USA Ocean Celebration 2015. We are pleased that we were able to share in the occasion with you. We hope that you found the event(s) worthwhile. Your presence helped to make this event a great success! We wish you all the best and hope that you continue to be engaged with our work. In order to make next year’s events even more successful we request that you fill out the post-event survey. We thank you in advance for your comments and suggestions and we assure you that each will be given consideration so that future events will be even more of a success. Stay tuned for upcoming events by visiting www.keainc.org. We will keep you posted on our progress and hope you can join us again next year! PLEASE JOIN US AT ANY THESE EVENTS!! LOCATION: MARITIME MUSEUM OF SAN DIEGO/ SAN DIEGO, CA. 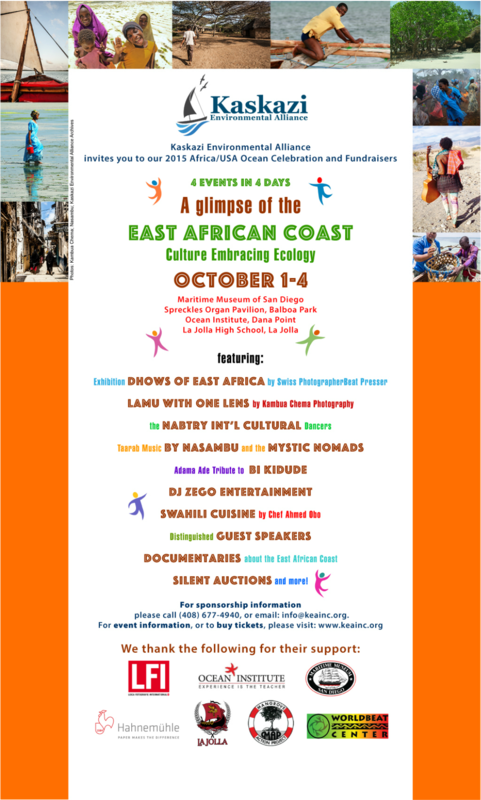 Be swept up in the centuries-old East African culture! Live performances featuring taarab music of East Africa, African drummers, and dancers. Click here to purchase tickets/reservations! LOCATION: SPECKLES ORGAN PAVILION, BALBOA PARK/SAN DIEGO, CA. What is a Harambee you may ask? ﻿LOCATION: THE OCEAN INSTITUTE/ DANA POINT, CA. Embark on a voyage of East Africa’s coast through these breathtaking photographs by Swiss photographer Brett Presser. Dhow documents Presser’s journey along the east African coast on a dhow, a traditional sailing vessel, exploring the rich culture, history and deep interconnection between the ocean and the Swahili people. This exhibition has been around the world, and, notably, it travelled by dhow along the coast of East Africa stopping at numerous locations. This journey was documented in the 20-minute film Kusi na Kaskazi which accompanies Presser’s exhibit. Also enjoy Lamu Sailing Regatta short video.